Unlike many modern yoga retreats, ashrams remain true to their traditional roots. Ashram life is different from everyday life; distractions are minimised, and everyone on site shares a common purpose. They are incredible places to delve deep into the mind and concentrate on self-inquiry and profound internal work. If you’re looking for an ashram to experience authentic yoga and meditation practices, and guidance from highly experienced practitioners and teachers, it can be difficult to know where to start. This article is a small guide to Ashram life in India. Click here to read our full guide to Ashrams in India. • A modest dress code. Usually, shoes are not permitted within meditation and yoga rooms. Clothing is expected to cover shoulders and knees. Some ashrams may provide clothing. Loose, cotton garments are much better and more appropriate than the tight lycra yoga gear that’s often worn in the West. • Simple vegetarian or vegan food — ashrams provide a nourishing and balanced diet and work on principles of ahimsa (non-violence), so do not bring animal products on site without permission. For a more detailed guideline to ashram etiquette, click here. Founded by Swami Satyananda Saraswati in 1964, the Bihar School of Yoga is an ashram dedicated to yoga practitioners serious about learning traditional Hatha Yoga. Located in Ganga Darshan, Munger, Bihar, this gurukul ashram provides a yogic seeker with the right tools and knowledge that is steeped in Vedic, Tantric and Yogic traditions. The Ganga Darshan Yogashram at Bihar School of Yoga follows a specific timetable, where you’re required to wake up at 4:00 am for your personal Sadhana. This ashram is the perfect spiritual oasis for the seekers and yoga practitioners. Click here to read more about this Ashram. In the foothills of Kerala’s the Western Ghats, this area is set within incredible natural beauty — forests, mountains and colourful flowers are everywhere you look. It’s a warm, friendly place and offers instruction in classical yoga techniques and meditation, all rooted in the teachings of Swami Sivananda and Swami Vishnudevananda. The daily schedule is simple but well structured and designed to guide you deep into an immersive yoga experience. Phool Chatti Ashram is situated in the north of India along the banks of the Ganges River in the foothills of the Himalayan Mountains. Set in stunning gardens and surrounded by mountains, the name “Phool Chatti” means “Land of Flowers”. Phool Chatti Ashram has been welcoming spiritual seekers for meditation, renewal, and spiritual growth for over 120 years. More information on this ashram can be found here. 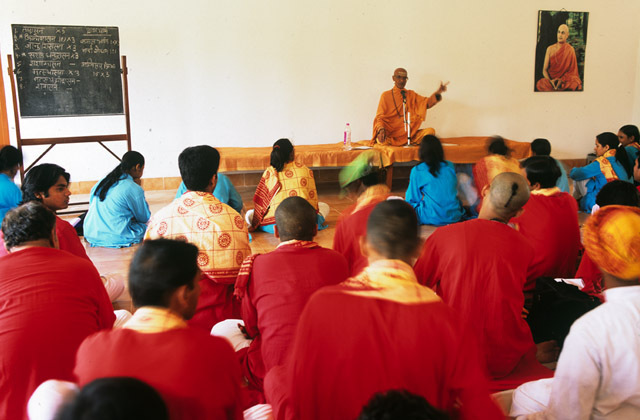 The Ashram is headed by the Swami Dayananda Saraswati, who is a teacher of contemporary Vedanta and a scholar in the ancient script of Sanskrit in the Sankara tradition. He has been teaching for more than five decades in India and began spreading his teachings abroad in 1976. Swami is also well-known for his humanitarian efforts in India and his participation as a speaker for many international forums. Click here to read the Ashram’s full profile. If you’re looking for an authentic ashram experience in India, then do click here to explore all the Yoga ashrams that are registered in our Yoga directory.